Satan is back and he plays British Heavy Metal. Do you really need more than that to run off and grab your copy of 'Cruel Magic'? Satan are one of the most original bands playing pure Heavy Metal today and their label Metal Blade knows it very well, proudly presenting an album that's going to be a milestone in the band's career. 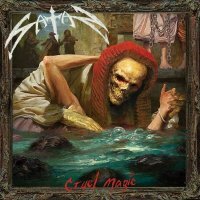 From their comeback in 2013, Satan are raising the bar and with this latest album they've hit the bullseye; it's a perfect balance between tradition, power and innovation. We can find a solid old-school base of the highest quality in songs like the opener 'Into The Mouth Of Eternity', where the guitars are on fire, and 'Legions Hellbound', but we can also hear something different and extremely interesting in 'Cruel Magic' and 'My Prophetic Soul', both looking at the seventies without losing a glance of power. They play fast, hard and loud, and 'The Doomsday Clock' has got their trademark sound with an incredible performance from drummer Sean Taylor who gives the song an explosive energy. The band is raw and grounded in this reality, but they can surprise us with all the ghouls and spirits found in 'Ophidian', a very emotional song with evocative atmospheres alongside glimpses of Black Sabbath and Led Zeppelin. Under the same wing, there's 'Ghosts Of Monongah' with its light and shade, but above all, Brian Ross singing on the shields, all of which combine for a brilliant result. With this album, Satan confirm that they've got a vein of originality as well as a fresh inspiration in their song-writing and arrangements, they are following their own path and not a popular trend without patterns or external influences. 'Cruel Magic' is heterogeneous and diverse, but with all the good stuff in the right place. If you need something sounding genuine and you're looking for some true Heavy Metal, you've just found one of the most impressive releases of the year.